A birthday, a name song, and never knowing where you will find information, 1891. 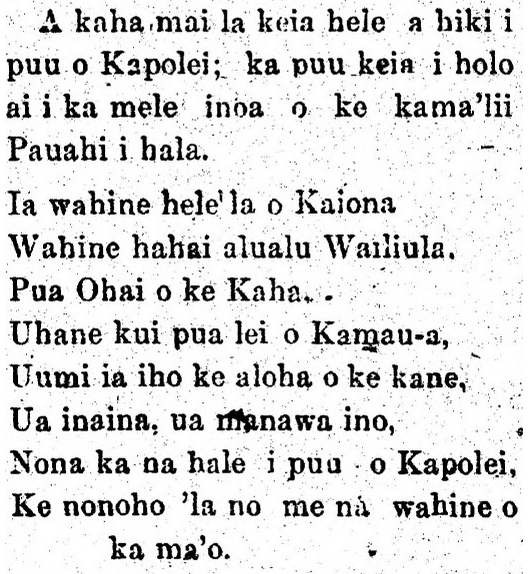 Ke nonoho ‘la no me na wahine o ka ma’o. 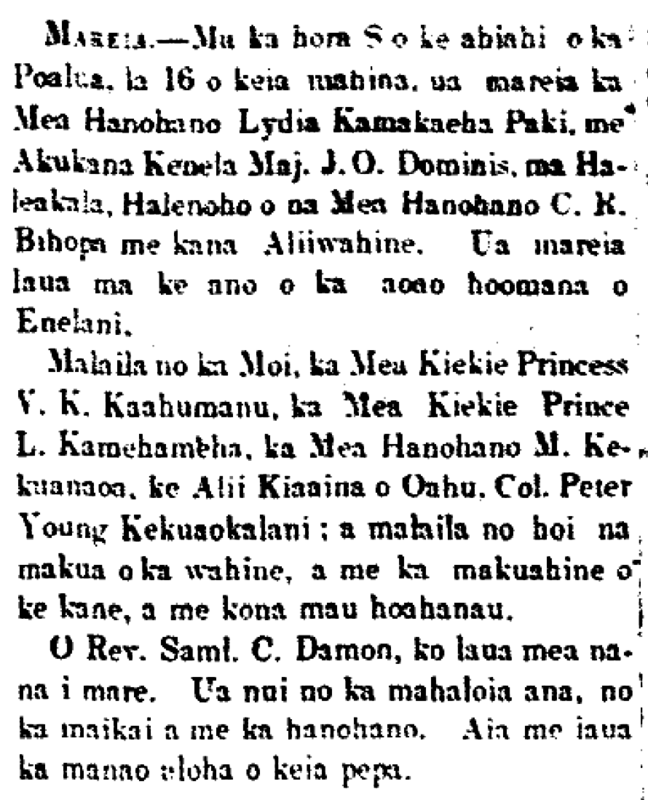 Ka Leo o ka Lahui, Buke II, Helu 227, Aoao 4. Iulai 1, 1891. The Kamehameha Museum and the Kamehameha Schools, 1894. THE ASSETS OF THE KAMEHAMEHA SCHOOLS. In the will of Mrs. Bernice Pauahi Bishop, who died on the 16th of October 1884, she set aside lands whose true value comes to $400,000, with $10,000 profit per year. These lands are in the hands of five trustees, with the stipulation that the profits go to the building and caring for a school for boys and girls. This generosity was based on true aloha. On the 5th of April, 1885, the trustees met for the first time and selected the Hon. C. R. Bishop as President, Hon. S. M. Damon as treasurer, and Mr. C. M. Cooke as secretary. They are the finance committee, along with Rev. C. M. Hyde and W. O. Smith, made the education committee. On the 20th of August, 1886, up in Kalihi was chosen as the place where the school would stand, and Rev. W. B. Olsen of the Hilo boarding school to be a teacher, and the curriculum for three years was prepared and approved on the 25th of March, 1887. The cafeteria and some dormitories were completed on the 20th of October of that same year, and the school began with 50 students. There were two dormitories just built, which can house 126 students. One more dormitory is planned which will increase the number of students to 200. However more than that number of students can be accommodated. In the will of Pauahi, the trustees were instructed to “build an English-language school where the children were to be educated in the regular branches of knowledge, and they were also to be educated to live morally and with important knowledge to make them industrious men and women, and I want high branches of knowledge to supplement those basics.” It is desired that the trustees “use a portion of the profits to go to the education and care of the indigent orphaned Hawaiian children.” As per the will, the school is opened to native Hawaiians, being that the trustees believe that was the true intent of Pauahi. However, the Hawaiians are not interested in the good put before them, the will does not preclude the the provision of those blessings to the other races who want to receive the benefits of an education. The land set aside for the building of the school is up in Kalihi. The land mauka of King Street is set aside for the boys’ school; this is where the Kamehameha School now stands; the area of that land is 82 acres. There are 30 acres makai of the street, which is set aside for the girls’ school. The area for this school is in the heights of Kulaokaiwiula with it face overlooking the cit of Honolulu, and it is constantly fanned by the cool air of the valley of Kalihi; there is no other finer place for the health, the beauty, and the suitability as a school campus like this. Clear water is supplied to the school. Below that are the workshops, the sewing shop and the printing shop. And mauka of these buildings is the mechanic shop. …iron beds. The schools cafeteria is a long building, and it was built in the form of a cross. There are 20 dining tables accommodating 200 people at a time. Behind the children dormitories, are their laundry building, and so forth. Behind the principal’s house is the gymnasium. The museum is on the makai side of the principal’s house. This is a grand a beautiful structure constructed with rock from atop the land. Makai of the museum is Bishop Hall, and this is where the school rooms of the students are. This building is furnished with a library and a reading room. On the makai side, almost adjacent to the road is the Kamehameha Preparatory School; there are sixty students from seven until twelve years of age. In the yearly report of the Trustees for 1893 to the Chief Justice, it was seen that the school’s annual income was $62,008.55. $33,545.15 was spent on the boys’ school. It was the Hon. C. R. Bishop who paid for the entire cost of the building of the Pauahi Bishop Museum and the preparatory school. Bishop also recently gave some of his valuable land holdings under the trustees, and several months ago, Mr. Bishop forwarded bonds of $30,000 for the benefit of the school, and the yearly income of these assets will be apportioned for the care and the expansion of the Pauahi Museum. [It was just serendipity that caused me to notice this article the other day, and I thought with the re-opening of the new Pacific Hall at the Bernice Pauahi Bishop Museum, there was no better time to post this article about the actual beginnings of the Museum and of the Kamehameha Schools. Check the early years of this familiar building (minus the dome) on campus as well, from an earlier post! 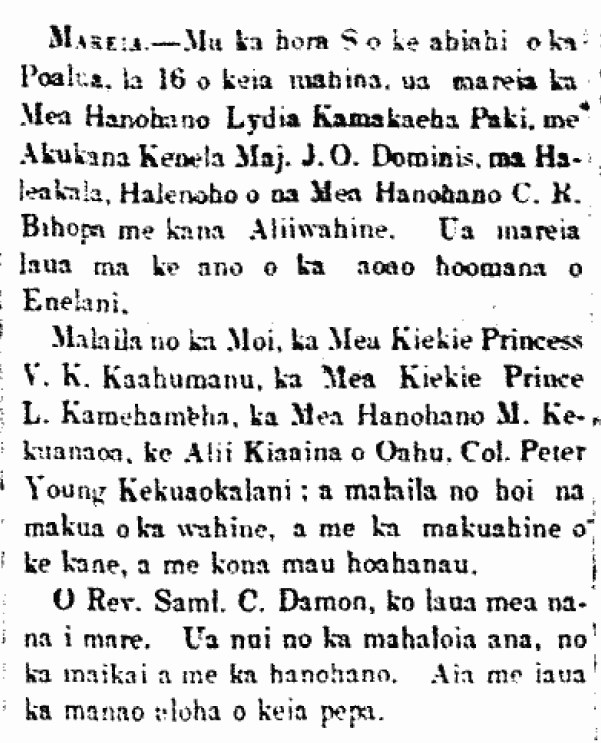 Ka Nupepa Kuokoa, Buke XXXIII, Helu 21, Aoao 1. Mei 26, 1894. Bernice Pauahi Bishop Museum, Dekemaba 19, 2012.